CRS online scale calibration certificate software is a portable, hand-held tool is ideal for performing on-site calibrations, allowing access to a secure database of information. A scale technician can easily enter calibration data and customers can quickly view and print certificate(s) from stored data. CRS online scale calibration certificate software is a portable, hand-held tool is ideal for performing on-site calibrations, allowing access to a secure database of information. 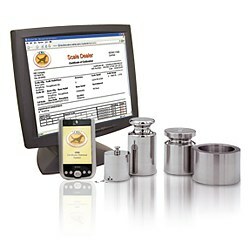 A scale technician can easily enter calibration data and customers can quickly print certificate from stored information.